(CTS +) Finally In SAP Cloud Platform- IS! I am very excited to put this blog together as must awaited feature to move objects across the landscape is finally made available by SAP on a cloud platform. This enhanced change and transport management ( CTS+ ) feature will allow the developers to leverage similar advantage that is available in traditional systems. In SAP cloud platform you can still perform manual import and export of the data. In this blog, I will be explaining how to configure and create MTAR file which then can be attached to transport request to be imported into specific systems in the landscape. Note: The MTAR file needs to be added manually to transport request and released into the system of interest. Why does a MATAR file need to be generated? When complex business scenarios are created in cloud platform it is mainly focused on micro-services design, API management of cloud platform and different protocols such as SOAP and OData services which are used to send, trigger and receive business transactions. This will be a complex list of objects when it comes to moving the same into another environment. In order to address these issues SAP came out with the concept of Multiple Target Applications( MTA). MTA consists of applications which are created using different technologies and are deployed on different runtime environments but having the same solution and functional lifecycle. 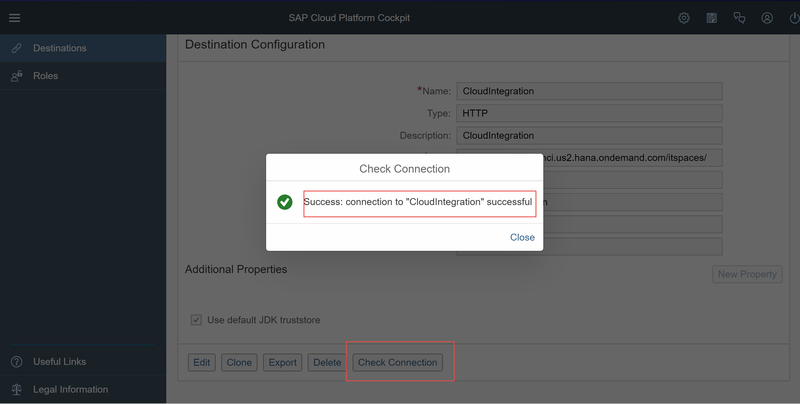 Let’s look into configuring CTS+ in SAP Cloud Platform- Integration services. Step1: Go to settings Integration service tenant and set transport to CTS+ as shown below. Step2: Add IntegrationContent.Transport role to your user in the SAP cloud platform cockpit as shown below. This needs to be done if you have a generic user for HTTP connection. In order for developers to be able to transport objects, they need to have IntegrationContent.Transport role assigned to their respective S- User. Step3: In order to transport objects in SAP cloud platform we need to enable Solutions Lifecycle Management service in the cockpit as shown below. This needs to be done in all the tenants from which the transport needs to be performed. Enabling services is a one-time activity. Step4: Once the Solutions Lifecycle Management service is activated. Then we need to configure the HTTP destination as shown below so that MATR file can be fetched successfully. Note: Make sure to use destination name is CloudIntegration (case- sensitive). The tenant URL will be https://tenantInstanceNumer-tmn.hci.us2.hana.ondemand.com/itspaces/. Further application URL’s can be found by clicking iflmap node as shown below. Step5: Test the connection and if successful you should receive results as shown below. Provide the information as required for your integration flow and click transport and a file with mtar file will be downloaded on to your local machine as configured in your browser. Once the mtar file is created then you need to configure transport landscape and attach the mtar file manually and then import into the target system. Please find the link below from SAP which describes in details how to setup ABAP backend system for HCI. See you my next blog!